With the largest indoor tropical garden in Scandinavia, the Scandic Infra City hotel is 15 minutes from Arlanda Airport and 20 minutes from central Stockholm. Swim laps in the indoor pool, stay in shape at the gym or unwind in the sauna. 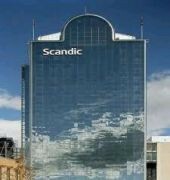 Dine at Flavours restaurant or enjoy a drink in the bar in the glass-roofed atrium at Scandic Infra City hotel. Stockholm attractions like the Royal Palace are 20 minutes' drive away. Enjoy 25 meeting rooms with wireless Internet access.